The cement is used as an example to show how Islam is portrayed in media where it has been considered as a religion of cruelty, oppression, and brutality; however, it is misunderstood by millions. Islam (meaning peace and submission to God), is a religion of ethics, obedience, harmony, and is based on a faithful belief system. Since the time the religion was revealed, Islam has laid out a religiously pure belief system and has promoted advancements in several branches of science. Soon after Muslim immigration into America and other regions in the western world, Muslims have found it increasingly difficult to endure these misconceptions. The religion of Islam is not a religion of hatred and violence, but a religion of respect for all humans and God. This is the true Islam, the religion of equality, morality, and faith. 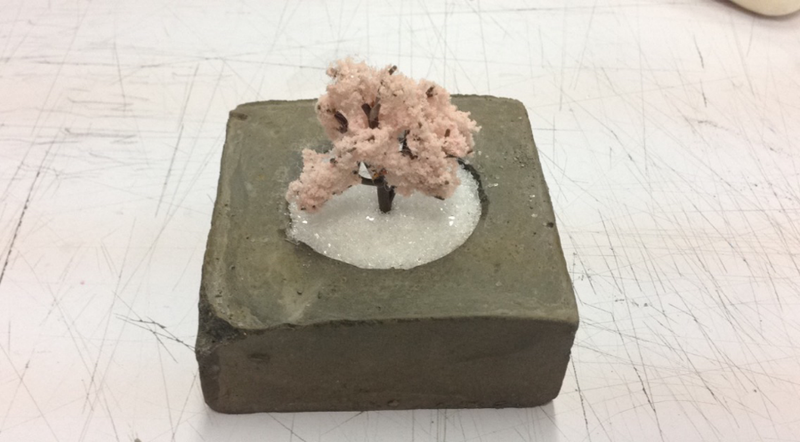 To show that I’ve used the glass to represent snow and in the very middle a tree blossoms. The tree that I have used was inspired by the cherry blossom tree. The cherry blossom tree is found in japan. You might be asking yourself. How does a tree in japan represent Islam and peace; however, these flowering trees are a symbol of peace and hope, which is why I used it because I wanted to show that in the end there is hope or Islam if one could truly open their mind and see beyond media and the press. They will find how beautiful Islam is. Stoning of adulterers is seen as a barbaric act that only exists in the Islamic world. The news media is quick to point out that the act of adultery is condemned within Islam therefore stoning is what the Quran dictates. Bill Maher and others are quick to point this out as well. They are not wrong in the sense that when they hear about a stoning it’s in Muslim nations and hence it must be part of their religion. The issue is instead taking what a few say or do as proof a religion is inherently evil or advocates ignorance and violence, they should research it instead. All Muslim countries do not practice stoning today, only a handful of these nations. Actually the punishment of stoning of adulterers is not mentioned anywhere in the Quran.